My clients with ADD are a blessing to me! They are the brightest, most creative and most fun people on the planet! The gift of ADD is the natural flow of ideas, thoughts and scenarios generated by prolific thinking. ADD people continually come up with new ideas that lead to solving problems, engaging people with new concepts, and starting new projects. Working from these strengths is important for people with ADD. However, when tasks are tedious, mundane and repetitive, it becomes a challenge. People with ADD become disengaged and bored, unable to complete these tasks. When the possibilities are endless and exuberant, people with ADD are at their best. To catch and prioritize information is important for productivity for people with ADD. In tackling this first step of containing information, there are an array of options such as low tech post it notes, spiral notebooks, the planner pad (www.plannerpad.com), Levenger CIRCA notebooks (www.levenger.com), and technology such as www.evernote.com. Establishing your personal system and working it are important. Keep practicing with your system for a minimum of 21 days for your system to become a habit. Once captured, prioritizing what is critical to success is important. Making decisions can be one of the biggest challenges facing a person with ADD. First the decision is what is important and what is not. Keeping everything on the list is a way of not deciding. Decisions can be formulated by simple and consistent rules that synchronize with personal goals and mission. With prioritizing as the key, it is important to go beyond making lists. A list can start out as a “brain dump” and then it can be refined. After making the list, create a short, 3 task Most Important Things list. This leads to accomplishment, working toward a goal and feel productive for the day. If it is exceedingly difficult to define tasks, enlist the help of an accountability partner or coach to keep on track and be authentic in aligning your goals and tasks. Homework strikes fear in the hearts of kids and parents! And getting organized with your child can be tough! Here are a few products that can make a difference for both of you! Start the process with open minded listening to your child. The system you create needs to be the one they own, not your’s. By presenting several different ways to do the same thing, you are co-creating the system, not demanding it. Sci or Bio or Chem hw, etc. Determine if homework is going into each section, or is the one place for homework in a the front pocket of the notebook. Be sure to be specific on each slot the paper goes so every type of paper has one slot. System 2. Accordian file. Purchase a 7 slot accordian file. Label each tab, including the following, HW, classes in order of the day, notebook paper. Once the system is established, establish the routine. Papers are always in one of the slots, never in the backpack. Once the marking period is complete, the paper moves to the desk top paper sorter, labeled by class. This way only the current paper is being carried back and forth to school. The Big Mouth Sorter fits directly into the back pack as an alternative to the accordian file . Again, label it by class in chronological order of the day. Establish routines for students with starting and completing homework. Homework should start after a snack and a little time off. It should be completed no later than 9 pm. The time timer helps students stay in track during homework time. It is a visual reminder of their work time. I recommend using a “power period” of 50 minutes of work and 10 minutes off. This way students remain motivated and get the work done. At the end of homework time, everything is packed away and placed at the landing strip to head out in the morning. Most people know of a home in their neighborhood where the home is obviously overflowing with clutter. Some homes begin to not function and contents spills out into the yard. Most people have no idea where to turn to for help. Hoarders (television show on Monday nights) has created an amazing buzz in my world of professional organizing. Each 60-minute episode of Hoarders is a fascinating look inside the lives of two different people whose inability to part with their belongings is so out of control that they are on the verge of a personal crisis. Certified Professional Organizers are featured on the show, especially Geralin Thomas of Metropolitan Organizing http://metropolitanorganizing.com/. As the clients and CPOs work together, public viewers watching are touched in a unique and powerful way. Viewers identify with many of the challenges faced on the show. The attachment and emotional issues make an impact in a way no family member can! It is a powerful agent for change to have a new outside perspective on people and their stuff. Over 10 million people in the US have clinically significant hoarding. This equates to 2 – 5 % of the population. The average age at treatment is 50. They tend to be single and have a high rate of divorce. They tend to live alone and there is usually a family history of hoarding. Onset usually occurs in childhood but does not become severe until adulthood. Hoarding affects people regardless of socio-economic level. As recently as last year in Houston, a River Oaks couple was unable to be rescued from their home due to hoarding. http://www.texas-fire.com/2009/01/17/houston-fire-kills-houston-neurosurgeon-wife/. What defines hoarding? http://www.newswise.com/articles/view/531200/ Hoarders have a brain disorder resulting in an all-consuming compulsion to collect that often cuts them off from society and damages their relationships. In severe cases, clutter can get so out of control it can cause complicated medical issues, endanger lives and create safety hazards. The best help for those with hoarding issues begins with collaborative therapy with a counselor and a certified professional organizer or (CPO or CPO-CD). There is a workbook available to begin the process, Buried In Treasures: Help for Compulsive Acquiring, Saving and Hoarding by By David F. Tolin, Ph.D., Randy O. Frost, Ph.D., and Gail Steketee, Ph.D. How to help a family member with this illness? Seek professional guidance to begin the process. There is hope and help for you and your family. There are so many ways to begin the organizing process, from reading a great book to asking a friend to be your clutter buddy to hiring a professional organizer. The Clutter Support Group is one more of these valuable tools in the journey to living an uncluttered life. With so much on television and in the media about hoarding, people are beginning to recognize how important starting this journey is. Let me share with you a little of the logistics. Our Clutter Support Group meets weekly for 6 weeks with 7 incredible women committed to change in their lives. As they affirm and nurture others, they also work individually on a project in their home. What do they say is most valuable about our group? I am honored to be a part of their efforts as they confidentially reveal what has troubled them most. We draw our strengths from each other as we work to create the home and the life we envison! Interested in joining the next Clutter Support Group? Contact me to learn more! In the last month, while speaking to moms all over the greater Houston area, I have learned many success tips for families. Here are a few shared by moms of young children. Write a list of 5 things you do every morning and do them before 9 am. This includes empty the dishwasher, start a load of wash, quick vaccum or whatever else is most important to get the day going. Create an evening routine for you and your kids that includes bathtime, laying out all clothes including shoes, backpacks packed and breakfast table set. Sort your toys into bins and label the bins. Your kids will not play with the tea set if the saucer is missing! Keep toys together that are played with together. Play with your child first, then get your tasks complete. Your kids will be happier and so will you if their needs are met, then you complete your other jobs. Have your kids help with the laundry. Host the laundry party once a week, put on fun music, and get it all into baskets and back to their closets. Have a laundry basket in each child’s room to take the laundry to the washer and bring it back from the dryer. Using a command center for papers makes all the difference. I have one place to look for paper this way. Over and over I find that having a routine for my family makes the most difference. Writing it out on a paper helps me remember what our routine is. 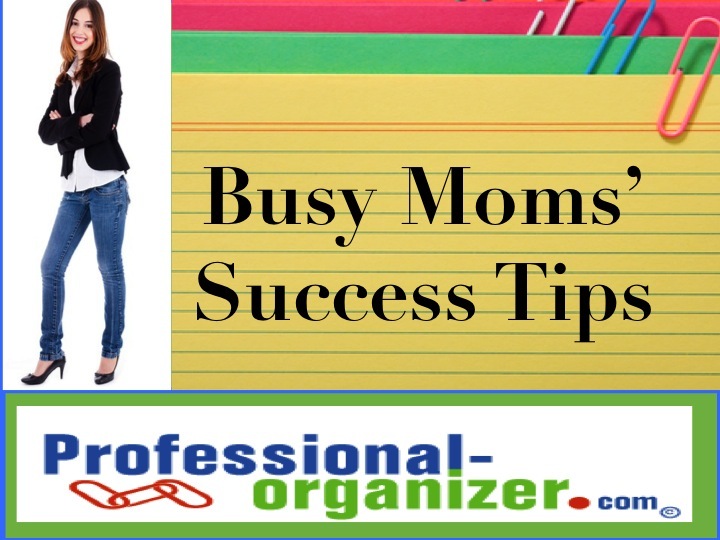 What are your busy mom’s success tips?